After you download your file, open Photoshop and bring your image in. It's always good practice to find out the sizing of the image before you start work on it. You can do this by clicking Open... and choosing your file from the popup box. You will see two different layers: one for the product, and one for the shadow. The shadow layer needs to be set to multiply so that when you swap out the background, it will blend in naturally and look awesome. You can also toggle the visibility of the shadow off altogether. 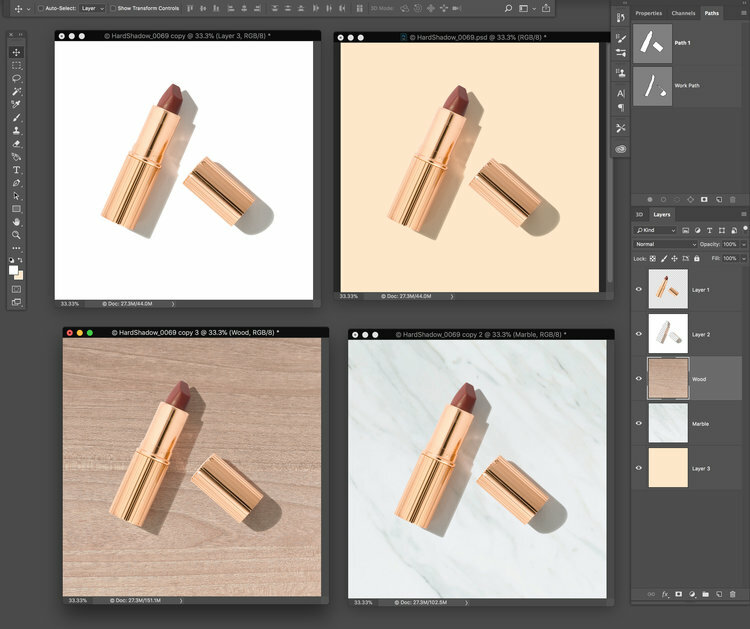 The options are endless: add a stylish background like the stock image of marble in the tutorial video for a classy look, or maybe a woodgrain for an outdoorsy feel. Just drag and drop the image into your new layer and resize it as needed. If you’d rather just change the color, select your new layer and then click the color tool in the toolbar on the left side of the window. Be creative! In the tutorial video, we used the eyedropper tool to choose a color from the product itself. The red lipstick looks beautiful and really pops against the flat gold background! Select Edit > Fill... from the top toolbar and click OK.